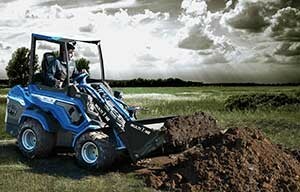 One versatile machine available in six models depending on your hp needs! More than 180 attachments to excavate and move dig dirt, level, prepare soil, load and move bulky materials and perform multiple tasks with just one machine. You can change attachments in minutes due to the multi quick connect design. With the telescoping boom it reaches higher than a traditional loader or skid steer. Thanks to the articulated frame and the DBS (Dynamic Block System) you can drive on lawns, paved areas and other sensitive surfaces without damaging them. The new series offers the best in class lifting capacity.